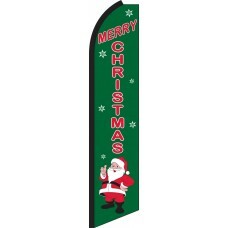 Our Holiday-Themed Feather Flags are a great way to decorate during the Holiday Season. Chose either our Happy Holiday, Merry Christmas, or both of our Holiday Swooper Feather Flags. 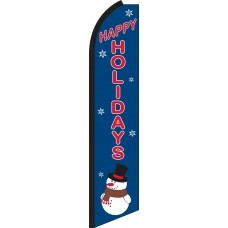 With vibrant graphics , you can show your holiday greetings with two of our popular flags for the holidays. As the flags ripple in the wind, they garner attention and show your customers that you care. We offer two different designs: "Happy Holidays" and "Merry Christmas" so that regardless of the cultural orientation of your location, we have the right design for you. We find that many companies in the Southern part of the United States prefer "Merry Christmas," while customers in the northeast prefer, "Happy Holidays." Regardless of which part of the country you are in, it is always safe to display both messages! If you are a car dealership, you should also look at our holiday greeting cards, and holiday hood covers which match our holiday themed Swooper Flags. This way, you can create a cohesive holiday themed advertising campaign that permeates many areas of your marketing.